The most unique IWB (Inside Waist Band) holster available! The VersaCarry™ is a revolutionary new IWB device. It uses a unique patent pending design that carries a firearm by the inner barrel diameter. This design allows for unlimited concealed carry possibilities, while remaining one of the smallest carry devices in the world. Note: Models shown with a strikethrough have sold out. To Purchase, Click on the VersaCarry You Need In the Table Below. are available at the bottom of this page. Read reviews of the The VersaCarry™ in the following online magazines! The VersaCarry™ System comes in 8 calibers and a variety of lengths to achieve the desired ride height. 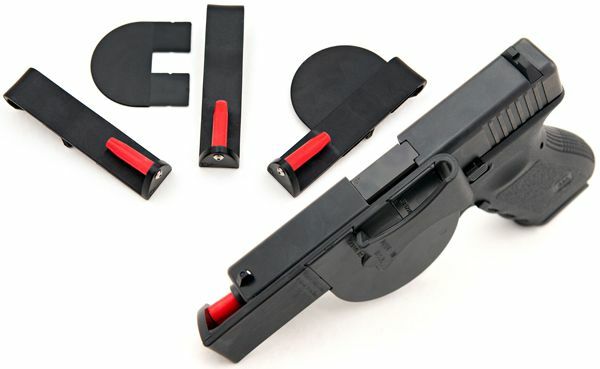 At the bottom of each size chart you will find the actual measurement of the VersaCarry™ clip. You can apply these measurements to your gun to see which size achieves your desired ride height. The shorter the VersaCarry™ clip is, the higher your gun will ride. Barrel Length 2.25" to 2.75" 2.80" to 3.25" 3.30" to 3.75"
Actual Clip Size 3.25" 3.75" 4.25"
Barrel Length 2.80" to 3.25" 3.30" to 3.75" 3.80" to 4.25" 4.30" to 4.75" 4.80" to 5.25"
Actual Clip Size 3.75" 4.25" 4.75" 5.25" 5.75"
ride height, select a longer VersaCarry™ from the chart. This cart contains an expansive list of firearms and the suggested VersaCarry™ sizes. VersaCarry is a trademark of SITZCO, LLC. Do Not carry any semi-auto firearm in a locked and cocked condition or with a live round in the chamber. Do Not use this product without a belt designed for concealed carry. Do Not use this product for outside the waistband (OWB) carry. Read included instruction manual prior to use. Do not discharge any firearm with this product inserted in the barrel.